We are pleased to introduce ourselves as the largest, first and foremost supplier of a variety of precision Astronomical Telescopes, Spotting Scopes, Computerised GoTo Systems, Binoculars and Astronomical Accessories in India. They include Newtonian Reflector Telescopes, Refractor Telescopes, Maksutov Cassegrain Telescopes, GSO (Made in Taiwan) Dobsonian and Ritchey–Chretien Telescopes. A Little About M/s Tejraj & Co.
"TEJRAJ & CO was established in Mumbai as a small part time business engaged in Manufacturing Precision Astronomical Telescopes, specially Newtonian Telescopes, in April 1976. The owner Dr. Raju Patel, has more than 40 years experience in Telescope designing and manufacturing and is an observational astronomer and astrophotographer for the past 35 years. Our range of Telescope vary from ORION, KONUS, Bresser, GSO, Explore Scientific, Skywatcher and STARTRACKER System series. 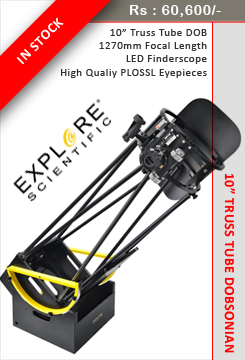 They represents the finest, most economical and advanced telescope of their types available in India and are very competitively priced with a wider range of accessories as per individual budget. We are proud to be India's leading telescope specialists. We provide exceptional after sales service to customers who buy Telescopes and Accessories from Tejraj & Co.
We have supplied professional telescopes to amateur astronomers, schools, colleges and reputed companies in India. Go through our large product inventory to select from the finest Refractor Telescope, Reflector Telescope, Dobsonian Telescope & Binoculars in stock for your current and future Astronomical needs. Feel free to call us to address your queries and to speak to an expert.